Congratulations to second grader Dylan Hoffman of Caledonia, Wisconsin! 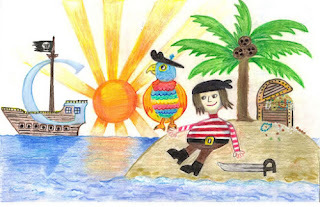 Here is his description of his doodle: He would travel back in time and "sail a pirate ship looking for treasure, have a colorful pet parrot and enjoy beautiful sunsets from deserted islands." 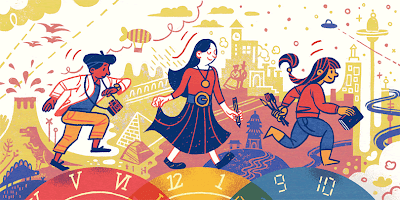 Along with his doodle being featured on the Google homepage today, Dylan won 30,000 college scholarship, a Chromebook computer and a $50,000 technology grant for his school. Wow! Go check out his awesome doodle on the Google homepage or visit the Doodle 4 Google page.